SHARK Energy Drink is owned by Osotspa Company Limited based in Bangkok Thailand. Osotspa have more than 120 years of heritage, but it’s their innovation that has made them a world leader in speciality drinks that refresh the mind and body. Each year more than a billion people in over 80 countries enjoy a drink from Osotspa and that number is continuously growing. So when other energy drinks were waiting to be thought of, Osotspa the makers of SHARK, had already made its mark on the energy market. Over the years, independent taste tests against the leading competitor continually show that consumers prefer the taste of SHARK Energy Drink! SHARK does not only satisfy a frenzied thirst, but with its fruiter taste, has also become a well-established mixer. It’s available in a number of variations including carbonated, sugar-free and even non-carbonated. Unlike most other brands that use artificial caffeine, SHARK uses natural caffeine from coffee beans and together with other ingredients; it provides a sustained release of inner energy. This and natural flavourings make it fruitier and more refreshing than other energy drinks. 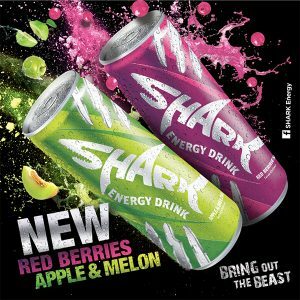 SHARK has attacked the energy drink market on all continents and is found in the hottest clubs and bars and the coolest cafes.